It's time to start taking a different approach to sales and marketing collateral. Every piece of collateral that Marketing produces and Sales uses contains data that is influenced not only by the contents of the collateral but by the approach taken during the sales process. 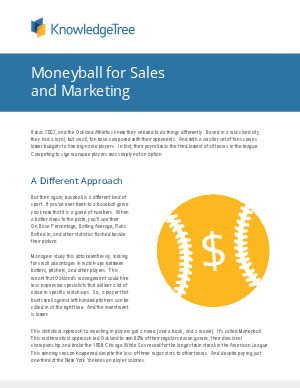 This data enables the Moneyball Manager to identify what collateral works based on defined criteria and historical data. Marketing is then able to refine collateral so that it stays relevant, not only for the prospect, but for Sales.